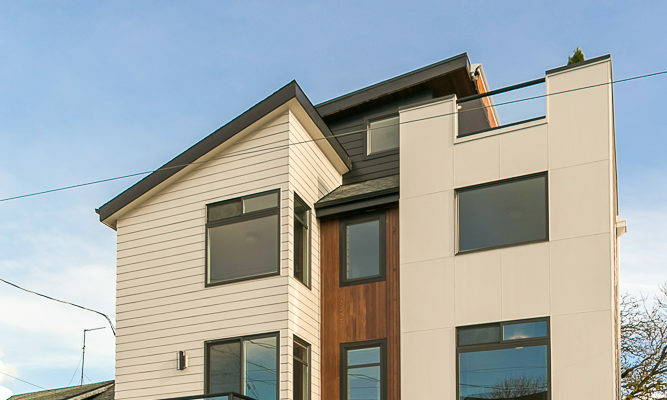 Offered at $937,000 this beautiful contemporary home has a one bed ADU that brings $1600 per month in rent. Architect Jacob Chavez has designed a residence which is efficient, quietly sophisticated, and, simultaneously, extends an overall feeling of generosity, spaciousness & peacefulness. A circular plan around a central stair creates efficient use of square footage allowing for open social spaces and quieter private spaces throughout the home. The gourmet kitchen, spa-like master bath & roof top terrace create a luxurious atmosphere enhanced by large windows on 4 sides bringing in plentiful abundant natural light which bounces around interior walls (turn on your lights at dark!). The variegated grain & knots of 3rd grade oak floors offer materiality within a simple palette.